At the 5 December 1985 Christie's auction, a new record price of approximately US$156,000 was paid for a bottle of wine – a 1787 Château Lafite which was thought to be owned by Thomas Jefferson. The authenticity of the bottle has been challenged. On 29 October 2010 the record was broken at a Sotheby's auction in Hong Kong – three bottles of 1869 Chateau Lafite-Rothschild were sold for HK$1.8M (US$232,692) each. Recently[when?] the 2008 vintage produced a worldwide increase in price of over 125% in six months from release, which in turn has come to push some Asian countries to the top of the list of worldwide markets in which investment grade wine is purchased. In early November 2012, police in the city of Wenzhou, China, seized nearly 10,000 bottles of suspected counterfeit Châteaux Lafite Rothschild. Lafite is very popular among China's nouveau riche, but analysts suspect that between 50 and 70 per cent of wine labeled "Château Lafite Rothschild" in China is fake. If genuine, the collection seized in Wenzhou would have been worth up to $16 million (US). Across all vintages Lafite Rothschild is one of the most expensive wines in the world, with the average price per 750 ml bottle reaching $911. Prices for Carruades de Lafite rose dramatically due in part to Chinese demand, with the prices of its 2005 and 2000 vintage fetching over £10,000 per case. After peaking in 2011, however, the price of some vintages halved in two years. ^ a b Lichine, Alexis (1967). Alexis Lichine's Encyclopedia of Wines and Spirits. London: Cassell & Company Ltd. pp. 316–318. ^ Tzabar, Rami (28 November 2008). "Wine makers crack open hi-tech tricks". BBC. Retrieved 2018-10-31. The record auction price for a single bottle of wine is £96,000 ($156,000) for a 1787 Chateau Lafite, which was reputedly once owned by America's third President and author of the Declaration of Independence, Thomas Jefferson. ^ "A bottle of 1787 wine apparently bottled for Thomas..." London. UPI. 5 December 1985. Retrieved 2018-10-31. The bottle of 1787 Chateau Lafite, sold by West German music publisher Hardy Rodestock of Wiesbaden, was bought by Christopher Forbes, third son of American magazine publisher Malcolm Forbes, for $157,500, Christie's auction house said. ^ Wilke, John R. (1 September 2006). "Wine Lover's Nose For Fakery Leads To Famed Bottles". The Wall Street Journal. Palm Beach, FL. Retrieved 2018-10-31. In December 1985, the late Malcolm Forbes paid $156,000 for a Jefferson Lafite at a Christie's auction, still a record bid for a bottle of wine. ^ GBP closed at ~$1.48 on the day of the auction per "Dollar Trades in Narrow Range". Financial Times (29798). UK. 6 December 1985. p. 43. Retrieved 2018-10-31. ^ Lelyveld, Joseph; (Special To the New York Times) (6 December 1985). "$156,450 Wine Sets a Record". The New York Times. London. p. B12 (00012). Retrieved 2018-10-31. A nearly two-century-old bottle of Chateau Lafite, believed to have been part of an order set aside for Thomas Jefferson, commanded $156,450 today at an auction here. 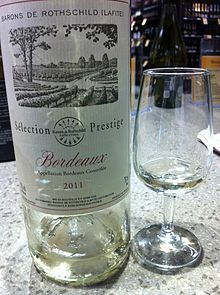 The winning bid was by far the highest price ever paid for a single bottle of wine. It was placed by Christopher Forbes on behalf of Forbes magazine, the American business publication. ^ For the controversy, which is still unresolved, see Wallace, Benjamin (2008). The Billionaire's Vinegar. New York: Crown. ISBN 9780307338778. ^ Huang, Nellie S. (30 October 2010). "Lafite 1869: $232,692 a Bottle". WSJ.com. Hong Kong: The Wall Street Journal. Retrieved 2018-10-31. ^ "'Fine wine' hoard highlights China's problem with fakes". BBC News. 9 November 2012. Retrieved 13 April 2017. ^ Yue Jones, Terril (9 June 2013). "Amid China's Boom, Fake Wines Proliferate". The New York Times. Reuters. Retrieved 13 April 2017. ^ Kevany, Sophie (7 May 2014). "Fake Bordeaux in China being made on offshore boats". Decanter. Retrieved 13 April 2017. ^ "Chateau Lafite Rothschild, Pauillac, France: prices". Wine Searcher. Retrieved 2016-11-23. Wikimedia Commons has media related to Château Lafite-Rothschild.